This fibreglass matte black cube planter is designed and manufactured with consideration of the value that commercial as well as casual landscapers place in high quality and reliable products. The fibreglass combined with the matte black colour scheme of this cube planter adds a sleek and striking, yet imposing look to the already durable and resilient structure and cube design. The carefully selected lightweight fibreglass allows for easy transportation and installation in any chosen space, whilst the weather and UV resistive properties of the fibreglass further extend its positioning possibilities. The versatility of the planter not only allows it for easy re-positioning indoors, but once established and filled the planters becomes sturdy allowing for anchoring against outdoor weather conditions. The clean lines and the simple geometric cube design makes the planter ideal for any modern indoor or outdoor space, or any customer who desires a high quality, sleek, minimalistic product to complete or reinvent their chosen space. 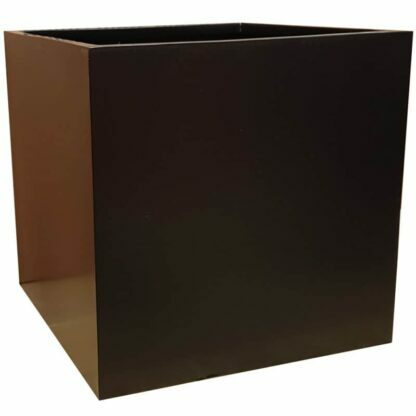 The neutral choice of colours in which this style of planter is available, particularly the matte black shown, creates opportunity for incorporating the cube planter into a wide variety of spaces. 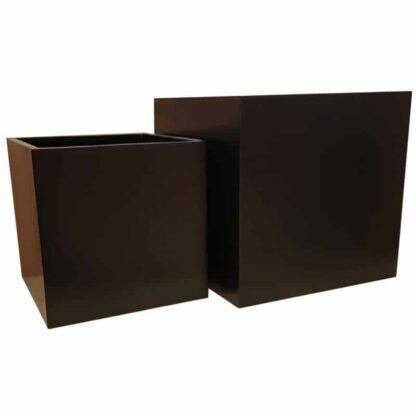 Whether used to contrast wooden floorboards and patios, or whether harmonised with stone, such as in kitchens and amongst other planters in our range, the neutrality of the matte black planter definitely does not limit your decorative and landscaping needs.